Manly is a beach-side suburb of northern Sydney, in the state of New South Wales, Australia. It is 17 kilometres (11 mi) north-east of the Sydney central business district and is currently one of the three administrative centres of the local government area of Northern Beaches Council. 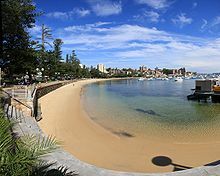 Manly has a long-standing reputation as a tourist destination, owing to its attractive setting on the Pacific Ocean and easy accessibility by ferry. The Aboriginal men were feasting on a whale at Manly Cove and were seen by Captain Nepean, Mr White, Nanbaree & a party of men who had travelled to Manly Cove to walk to Broken Bay. Bennelong and Colebee spoke to them and Bennelong asked for Governor Phillip. Captain Nepean sent the Boatswain back to Governor Phillip at South Head. The Aboriginal men cut large chunks of whale off and put them in the boat for Governor Phillip. The military party then proceeded on their walk to Broken Bay. When Governor Phillips party arrived to see the Aboriginal men they held friendly conversation with Bennelong and Colebee for over half an hour. Later an older Aboriginal man appeared with a spear. Captain Tench remarked that he was seemingly a stranger and little acquainted with Bennelong and Colebee. The Governor moved towards this man and the man became agitated. Governor Phillip threw down his dirk to appease the man crying out confidently. The spear was thrown and Governor Phillip was hit in the shoulder. All was in confusion, there were calls to bring the muskets, Bennelong and Colebee disappeared and Governor Phillip could not make it to the ship because of the length of spear sticking from his shoulder and dragging on the ground. The muskets were brought to shore but only one would fire. The spear was finally broken and all hastened to Port Jackson. Manly had been envisaged as a seaside resort by Henry Gilbert Smith in the 1850s. In 1853 Smith acquired two large parcels of land (which had been granted to John Thompson in 1842 and John Crane Parker in 1837). Initially John had chartered a paddle steamer to Manly and other vessels visited on an ad hoc "excursion" basis. Smith built a wharf on the harbour-side of Manly, which was completed in October 1855 and eventually acquired an interest in steamers himself. as part of developing more regular services to Manly to assist his sub-division property sales. By 1873, Smith had sold the lease to the wharf and his share of the steamers to the operators of the ferries and eventually ownership passed to the once famous Port Jackson & Manly Steamship Company. It was the Port Jackson & Manly Steamship Company which coined the expression about Manly being "Seven miles from Sydney and a thousand miles from care" to promote its ferry service. The Port Jackson & Manly Steamship Company played an important part in Manly's development. It built several attractions including a large ocean pool and bathing pavilion, the Manly Fun Pier. In 1972 the company was sold to Brambles Limited and in 1974 to the Government of New South Wales and it is now part of Sydney Ferries. In March 1885, as the New South Wales Contingent was about to depart for the Sudan, a letter was addressed to Premier William Bede Dalley containing a cheque for £25 for the Patriotic Fund 'with my best wishes from a little boy at Manly'. It was Australia's first overseas military adventure, and the "Little Boy from Manly: became a symbol either of patriotism or, among opponents of the adventure, of mindless chauvinism. especially due to a cartoon by Livingston Hopkins of The Bulletin. During the 19th and early 20th century Manly was one of Australia's most popular seaside holiday resorts. Manly Beach is said[who?] to be the place where the restriction on daylight sea bathing was first challenged in Australia. In October 1902 William Gocher, clad in a neck to knee costume, swam at midday after announcing his intention to do so in the newspaper he had established (Manly and North Sydney News). After being ignored by authorities and being publicly critical of them, he swam again and was escorted from the water by the police, although no charges were laid. In November 1903, Manly Council resolved to allow all-day bathing provided a neck to knee swimming costume was worn. During the first official bathing season in 1903, 17 people drowned on Manly Beach. A year later a surf club was formed on the beach to safeguard the public. While there is debate about which club is the oldest, Manly Life Saving Club is one of the world's first surf life saving clubs. In 1934, George Robey, a resident and original Anzac founded the 'Air Mindedness Development League' which was later renamed the Australian Air League at Manly. There has been a continuously running squadron in Manly since. In 1937 Manly Town Hall was opened. Manly is most notable for its beaches which are popular tourist destinations. Manly features a long stretch of sand on the ocean side, that runs from Queenscliff through North Steyne to South Steyne . This is followed by rock pools and sandy beaches called Fairy Bower and Shelly Beach. There are also a number of beaches on the harbour side of the peninsula. Norfolk Island pine trees are symbolic of Manly and are a prominent feature of both the ocean and harbour beaches. On 10 March 2012, the 4-kilometre (2.5 mi) stretch between Freshwater Beach and Shelly Beach was declared the "Manly -Freshwater World Surfing Reserve". The Reserve was dedicated in a ceremony in Manly Beach by world surfing champion Kelly Slater accompanied by the Governor of New South Wales, Australia, Her Excellency Professor The Honourable Dame Marie Bashir. The commercial Manly is centred around The Corso, which runs from the harbour side at Manly wharf to the ocean side at Manly Beach. Part of The Corso is a mall which allows outdoor dining for cafes and restaurants. The commercial area extends to surrounding streets with more cafes and restaurants concentrated along the ocean and harbour shores. Baz Luhrmann's The Great Gatsby (2013) was filmed in Sydney, primarily in Manly and Balmain. St Patrick's Seminary was used as Jay Gatsby's mansion–palm trees at the building's exterior had to be digitally removed in post-production to create a realistic depiction of the Eastern United States (specifically Long Island), where the novel and film are set. According to the 2016 census, there were 15,866 residents in Manly. 60.1% of residents were born in Australia. The most common countries of birth were England 11.7%, New Zealand 3.6%, United States 2.5%, Brazil 1.7% and South Africa 1.5%. 74.5% of residents spoke only English at home. Other languages spoken at home included French 2.3%, Spanish 2.1%, Portuguese 1.8%, German 1.7% and Italian 1.0%. The most common responses for religion in Manly were No Religion 42.1%, Catholic 20.6% and Anglican 13.8%. Transport services to Manly include a ferry service from Manly wharf, and State Transit bus services to the city and other suburbs. The Manly Ferry journey takes 30 minutes and allows for scenic views of Sydney Harbour, surrounding national parks and Sydney icons including the Harbour Bridge and Opera House. The ferry service once advertised Manly as "seven miles from Sydney, and a thousand miles from care". A privately owned and operated Manly Fast Ferry operates between Manly and Circular Quay, offering transport in a claimed trip time of 18 minutes, but this excludes unloading time. This replaced a similar but superior high speed operation that was run with a 15 minute (later 12 minute) trip hydrofoil service from 1964 until 1992 and then a 15 minute trip JetCat service which was used to replace the hydrofoils from 1990, but was withdrawn by the NSW Government in late December 2008. The relaxed lifestyle, beaches and proximity to Sydney city have led to Manly's real estate prices being amongst the highest in Australia. The adjoining suburb of Seaforth, which is now also part of Northern Beaches Council, has been ranked as the 25th richest suburb in Australia. The former Catholic seminary at St Patrick's Estate, Darley Road, now houses The International College of Management, Sydney (ICMS) a management college, specialising in business, tourism, hospitality, events, property, sports and marketing retail management. It is affiliated with Macquarie University, which attracts international students from many countries. As well as being an educational hub, many spectacular weddings have been held here, including Nicole Kidman and Keith Urban. The original seminary was designed by Hennessy and Sheerin and built in 1885. It was conceived by Archbishop Vaughan and is now listed on the Register of the National Estate. On the other side of Darley Road is the Archbishop's House, also known as the Cardinal's Palace. This building was also designed by Sheerin and Hennessy and built in the 1880s. It was originally conceived as part of St Patrick's Seminary and is a good example of the Victorian Gothic Revival style. It too is listed on the Register of the National Estate. Another notable landmark is the Presbyterian Church in Raglan Street. It was designed by John Sulman in the Romanesque style and built in 1892. It is listed on the Register of the National Estate. The closest secondary school for Manly is St Pauls College, which is a local boys high school for years 7 to 12. The Closest selective secondary school is Manly Selective Campus which caters for years 7 to 12 and is located in the neighbouring suburb of Curl Curl. Manly has Sydney Harbour on its western side with calm water, ferry wharf, a swimming area, the Oceanworld Manly aquarium, and sailing and yacht clubs. About 300 metres (1,000 ft) to the east is the Pacific Ocean and Manly Beach. There are more than 20 kilometres (12 mi) of cycle tracks that can be used to explore the area. The Manly International Jazz Festival is Australia's largest community-based jazz festival. It is held during the October long weekend public holiday, with various stages hosting continuous free public performances from midday until early evening. The BBC soap opera Out of the Blue was set in Manly. National Rugby League team the Manly-Warringah Sea Eagles who play their home games at Brookvale Oval, are the most famous sports club in the area who are well known for their Grand Final appearances, being the only club to appear in Grand Finals in each decade since the 1950s and the only club to win at least one Grand Final in each decade since the 1970s. Their fans from the northern beaches have a reputation for being reluctant to cross the Spit Bridge. The rugby union team Manly RUFC and soccer team Manly United Football Club represent Manly. The Manly Warringah District Cricket Club represent the Northern Beaches. Manly RUFC and the MWDCC play at Manly Oval, while Manly United play at Cromer Park. Numerous non-fiction books about Manly have been written. It has also featured in fiction. In 1987 the British novelist, Lesley Thomson published Seven Miles From Sydney, a thriller about a female screenwriter who is murdered while jogging on Shelly Beach. This novel was a popular seller in the United Kingdom and well received in Australia. The music video for Redfoo's song Let's Get Ridiculous was filmed on The Corso. Manly is a sister city of Bath, England. ^ a b Australian Bureau of Statistics (27 June 2017). "Manly (State Suburb)". 2016 Census QuickStats. Retrieved 6 July 2017. ^ "Spirit of the Kay-ye-my people coming home to Manly (press release)". Manly Council. 30 August 2004. Retrieved 28 February 2008. ^ Prescott, Anthony M. (March 1984). "The Manly Ferry – A history of the service and its operators, 1854–1974". University of Sydney (Faculty of Arts – thesis). Archived from the original on 2007-07-15. Retrieved 13 February 2008. ^ Lennon, Troy (2 November 2007). "Rough seas for the Harbour's first fleets". Daily Telegraph page 60. ^ Mitchell, Bruce (1983). "Gocher, William Henry (1856–1921)". Australian Dictionary of Biography. Retrieved 29 February 2008. ^ "Manly SLSC". Surf Life Saving New South Wales. Archived from the original on 1 December 2007. Retrieved 3 March 2008. ^ "Manly LSC History". Manly Life Saving Club. Archived from the original on 9 May 2008. Retrieved 3 March 2008. ^ "Australian Air League Official Website". Australian Air League Council. 2007. Retrieved 6 June 2008. ^ "St. Patricks Estate". New South Wales State Heritage Register. Office of Environment and Heritage. H01724. Retrieved 18 May 2018. ^ "North Head Quarantine Station & Reserve". New South Wales State Heritage Register. Office of Environment and Heritage. H01003. Retrieved 18 May 2018. ^ "Manly Cove Pavilion". New South Wales State Heritage Register. Office of Environment and Heritage. H01433. Retrieved 18 May 2018. ^ "Manly Wharf". New South Wales State Heritage Register. Office of Environment and Heritage. H01434. Retrieved 18 May 2018. ^ "Substation". New South Wales State Heritage Register. Office of Environment and Heritage. H00938. Retrieved 18 May 2018. ^ "BOM – Manly". June 2011. ^ "Kelly Slater Helps Launch Australian WSR". World Surfing Reserves. 10 March 2012. Archived from the original on 14 March 2012. Retrieved 11 March 2012. ^ "The real Great Gatsby locations". The Telegraph. May 14, 2013. Retrieved December 23, 2017. ^ Kimmorley, Sarah (7 May 2015). "The 25 richest suburbs in Australia". businessinsider.com.au. Retrieved 3 April 2018. ^ Museum, Powerhouse. "Cardinals Palace, Manly". Powerhouse Museum. Powerhouse Museum, Australia. Retrieved 9 May 2013. ^ "Manly". Sydney.com. Retrieved 27 January 2013. ^ "What to do in Manly – Festivals". ManlyAustralia.com. Retrieved 27 January 2013. ^ "BBC commissions new Aussie soap". BBC News. 1 December 2007. Retrieved 1 December 2007. ^ Michael Miller (22 February 2012). "Huntington finds a sister in Manly". Los Angeles Times. Retrieved 2017-09-04. Wikimedia Commons has media related to Manly, New South Wales. Wikivoyage has a travel guide for Manly.